Introducing Aromatica – rounded typeface with a simple and clean look that reminds us of those strokes found in handwriting while providing functionality and readability. 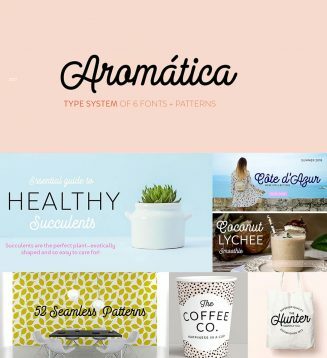 Aromática consists of 7 fonts: a monolinear Script, a Sans-serif of 5 weights, ranging from Extra Light to Bold, and a Patterns font, inspired by aromatic herbs and spices, which is the perfect companion to the Script and Sans faces. Tags: font family, monoline, pattern, rounded script, sans, sans serif, script. Where do i click to actually download the font?